Acute respiratory distress syndrome (ARDS) is a medical condition occurring in critically ill or critically wounded patients characterized by widespread inflammation in the lungs. ARDS is not a particular disease; rather, it is a clinical phenotype which may be triggered by various pathologies such as trauma, pneumonia and sepsis. 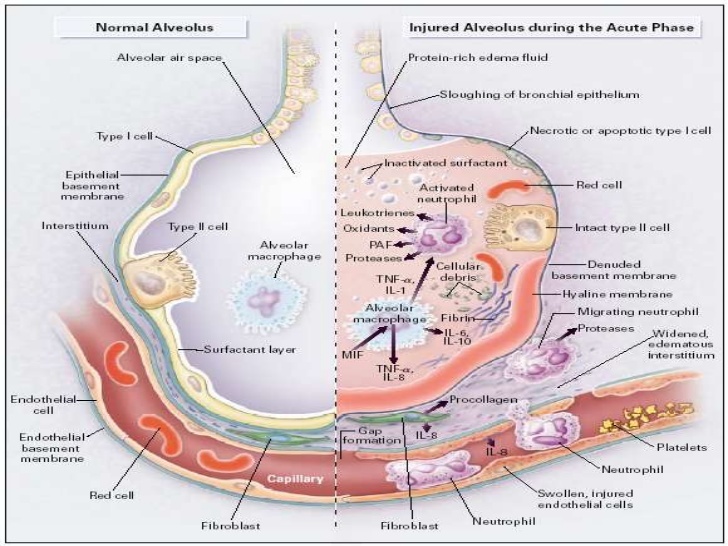 The hallmark of ARDS is diffuse injury to cells which form the barrier of the microscopic air sacs of the lungs, surfactant dysfunction, activation of the innate immune system response, and dysfunction of the body’s regulation of clotting and bleeding. In effect, ARDS impairs the lungs’ ability to exchange oxygen and carbon dioxide with the blood across a thin layer of the lungs’ microscopic air sacs known as alveoli. The syndrome is associated with a death rate between 20 and 50%. The risk of death varies based on severity, the person’s age, and the presence of other underlying medical conditions. Although the terminology of “adult respiratory distress syndrome” has at times been used to differentiate ARDS from “infant respiratory distress syndrome” in newborns, the international consensus is that “acute respiratory distress syndrome” is the best term because ARDS can affect people of all ages. Since World War I, it has been recognized that some patients with nonthoracic injuries, severe pancreatitis, massive transfusion, sepsis, and other conditions develop respiratory distress, diffuse lung infiltrates, and respiratory failure, sometimes after a delay of hours to days. Ashbaugh et al described 12 such patients in 1967, using the term “adult respiratory distress syndrome” to describe this condition. Many people who develop ARDS don’t survive. The risk of death increases with age and severity of illness. Of the people who do survive ARDS, some recover completely while others experience lasting damage to their lungs. ARDS occurs when there is another insult or injury to the body. This could any number of injuries such as pneumonia, breathing stomach contents into the lung, trauma, inflammation of the pancreas, any serious infection in the body, smoke inhalation from a house fire, medication reactions, near drowning or even blood transfusions. These insults to the body result in an inflammatory reaction that releases numerous natural molecules into the bloodstream. Normally this inflammatory reaction will be protective and help us fight infection or heal from an injury. However, in some people these inflammatory molecules will lead to the smallest blood vessels in the lungs to leak fluid. Fluid leaves these small vessels and goes into the tiny air sacs in our lungs called alveoli. These tiny air sacs fill with this fluid preventing oxygen from getting into the blood stream. Acute Respiratory Distress Syndrome, or ARDS, is a condition that causes fluid to leak into your lungs, blocking oxygen from getting to your organs. It is serious, sometimes life-threatening, and can get worse quickly. But it’s generally treatable and most people can recover from it. Fast diagnosis and treatment are important — your organs need enough oxygen to work right and keep you going. ARDS, or acute respiratory distress syndrome, is a lung condition that leads to low oxygen levels in the blood. ARDS can be life threatening because your body’s organs need oxygen-rich blood to work well. People who develop ARDS often are very ill with another disease or have major injuries. They might already be in the hospital when they develop ARDS. To understand ARDS, it helps to understand how the lungs work. When you breathe, air passes through your nose and mouth into your windpipe. The air then travels to your lungs’ air sacs. These sacs are called alveoli (al-VEE-uhl-eye). Small blood vessels called capillaries run through the walls of the air sacs. Oxygen passes from the air sacs into the capillaries and then into the bloodstream. Blood carries the oxygen to all parts of the body, including the body’s organs. In ARDS, infections, injuries, or other conditions cause the lung’s capillaries to leak more fluid than normal into the air sacs. This prevents the lungs from filling with air and moving enough oxygen into the bloodstream. As a result, the body’s organs (such as the kidneys and brain) don’t get the oxygen they need. Without oxygen, the organs may not work well or at all. People who develop ARDS often are in the hospital for other serious health problems. Rarely, people who aren’t hospitalized have health problems that lead to ARDS, such as severe pneumonia. If you have trouble breathing, call your doctor right away. If you have severe shortness of breath, call 9-1-1. All patients with ARDS will have shortness of breath, which is usually very severe. They will also have cough, and many will have fever. Those with ARDS will also have fast heart rates and be breathing rapidly. Occasionally they will experience chest pain especially with inhaling. Some patients that have very low oxygen levels may have bluish coloring of nails and lips from the severely decreased oxygen levels in the blood. Patients with ARDS have shortness of breath, often severe. They also have a cough and many have fever. Those with ARDS also have fast heart rates and rapid breathing. Occasionally, they experience chest pain, especially during inhalation. Some patients who have very low oxygen levels may have bluish coloring of nails and lips from the severely decreased oxygen levels in the blood. While many people are already in a hospital when they get ARDS, you should get medical treatment at once if you have these symptoms or see them in a loved one. The first signs and symptoms of ARDS are feeling like you can’t get enough air into your lungs, rapid breathing, and a low blood oxygen level. Other signs and symptoms depend on the cause of the ARDS. They may occur before ARDS develops. For example, if pneumonia is causing ARDS, you may have a cough and fever before you feel short of breath. Sometimes, people who have ARDS develop signs and symptoms such as low blood pressure, confusion, and extreme tiredness. This may mean that the body’s organs, such as the kidneys and heart, aren’t getting enough oxygen-rich blood. Most people who develop ARDS are in the hospital for other serious health problems. Rarely, people who aren’t hospitalized have health problems that lead to ARDS, such as severe pneumonia. blood transfusions (TRALI), severe burns, severe inflammation of the pancreas (pancreatitis), near-drowning or other aspiration events, drug reactions, or inhalation injuries. Some cases of ARDS are linked to large volumes of fluid used during post-trauma resuscitation. The most common cause of ARDS is sepsis, a serious and widespread infection of the bloodstream. Pancreatitis (inflammation of the pancreas), massive blood transfusions and burns. The causes of ARDS are divided into 2 categories: direct injuries to the lung or indirect injuries to the lung. Some of the direct injuries to the lung include pneumonia, breathing stomach contents into the lung, near drowning, lung bruising from trauma (such as a car accident), and smoke inhalation from a house fire. The indirect injuries to the lung include inflammation of the pancreas, severe infection (also known as sepsis), blood transfusions, burns and medication reactions. Fortunately, most patients with the above problems will not develop ARDS. It is not known why some will. In those that do develop ARDS the inflammatory reaction designed to help us heal becomes out of control. This leads to fluid leaking from the smallest blood vessels into the lung. ARDS is primarily caused by damage to the tiny blood vessels in your lungs. Fluid from these vessels leaks into the air sacs in your lungs. These air sacs are where your blood is oxygenated. When these air sacs fill with fluid, less oxygen gets to your blood. The causes of ARDS are divided into two categories: direct or indirect injuries to the lung. Some of the direct injuries to the lung include pneumonia, breathing stomach contents into the lung (also known as aspiration), near drowning, lung bruising from trauma (such as a car accident) and smoke inhalation from a house fire. The indirect injuries to the lung include inflammation of the pancreas, severe infection (also known as sepsis), blood transfusions, burns, and medication reactions. Fortunately, most patients with the above problems will not develop ARDS. It is not known why some will. The fluid buildup also makes the lungs heavy and stiff. This decreases the lungs’ ability to expand. The level of oxygen in the blood can stay dangerously low, even if the person receives oxygen from a breathing machine (ventilator) through a breathing tube (endotracheal tube). Doctors are still trying to learn more about this condition and why it happens. It’s not always clear what triggers a case. Sepsis: This is when you get an infection in your bloodstream, and your immune system goes into overdrive, causing inflammation and, eventually, blood clots. Accidents: Injuries from a car wreck or a fall can damage your lungs or that part of your brain that handles breathing. Breathing in harmful substances: Dense smoke or chemical fumes can trigger ARDS. This is a condition in which bacteria infect the bloodstream. This is an infection in the lungs. Severe bleeding caused by an injury to the body. An injury to the chest or head, like a severe blow. It’s not clear why some very sick or seriously injured people develop ARDS and others don’t. Researchers are trying to find out why ARDS develops and how to prevent it. Diagnostic criteria for ARDS have changed over time as understanding of the pathophysiology has evolved. The international consensus criteria for ARDS were most recently updated in 2012 and are known as the “Berlin definition”. In addition to generally broadening the diagnostic thresholds, other notable changes from the prior 1994 consensus criteria include discouraging the term “acute lung injury,” and defining grades of ARDS severity according to degree of decrease in the oxygen content of the blood. Note that the 2012 “Berlin criteria” are a modification of the prior 1994 consensus conference definitions (see history). The diagnosis is based on the patient’s symptoms, vital signs and chest x-ray when there are known risk factors present such as pneumonia or trauma. There is no single test that will confirm the diagnosis of ARDS. Patients with ARDS will have rapid onset of shortness of breath and very low oxygen in the blood. They will always require high amounts of oxygen. The chest x-ray will show fluid present in both lungs that is described as infiltrates by doctors interpreting chest x-rays. It is important that there be no evidence of heart disease which can also cause fluid to accumulate in the lungs. ARDS will often worsen in the first few days following the diagnosis before the lung begins to heal.